This Taylor of Old Bond Street Gift Set has the wow factor. It includes a Handmade Pure Badger Hair Shaving Brush and Taylor's signature, trademark, luxury Sandalwood Shaving Cream. This is the cream that Taylor's is best known for. 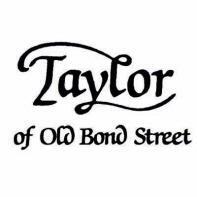 The brush benefits from Taylors branding which reads 'Taylor of Old Bond Street, The Shaving Shop, St. James, London'. This text is also is featured on the base of the storage box. The leatherette box looks so good, inside it's lined in brown and it has two compartments. This box will be very useful for storing a watch, cufflinks coins and other nick knacks. The lid stays closed with a stud magnet. Tub Weight: 150g. Formulated without parabens making it suitable for sensitive skin, Taylor's Sandalwood Shaving Cream will create a smooth and creamy lather whilst moisturising the skin and softening the hair to give a better shave. Made from Pure Badger Hair, this brush will lift and soften the bristles as well as exfoliate the skin underneath, preparing your skin for the shave to come. This Shaving Cream and Brush Gift Set is presented in a smart, Taylor of Old Bond Street branded gift box. Rinse the shaving brush under warm water and flick off any excess water. In the tub, lid or your lathering bowl swirl the brush in the cream for around 30 seconds until a rich creamy lather is produced. Paint the cream onto the face. After use, rinse the brush, dab it partially dry with a towel and leave it hanging upside down to dry. A beautiful Gift Set from Taylor of Old Bond Street. The brush with careful use and upkeep, will last for years to come while the box is a handy storage box for coins, a watch, cufflinks and self tapping screws (that's what I use wee boxes for). Not for you? Click here to browse our complete range of shaving sets to find the perfect set for yourself or someone special. Moulded handle filled with real, pure grade badger hair.